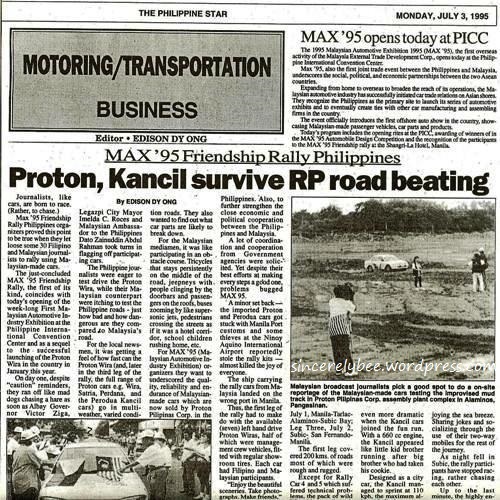 WRITING ABOUT THE Macau Grand Prix (link) brought back memories of a rally (albeit a friendship rally) that I was a part of – the MAX ’95 Friendship Rally in the Philippines, 30th June – 2nd July 1995. “Themed “Friendship Though Motoring”, the rally brought together more than 30 Malaysian and Filipino journalists on a historic 1,183 km journey through villages and major towns across Luzon Island. For three days, the convoy of a dozen Malaysian national cars – 4 Proton Wiras, 3 Proton Perdanas, 2 Satrias and 3 Perodua Kancils – made heads turn as they conquered the Philippines roads. Although a non-competitive rally, we weren’t least deprived of the thrills and excitement of a real rally adventure. The first-of-its kind rally was the result of Malaysian Prime Minister Datuk Seri Dr Mahathir Mohamad and Philippines President Fidel Ramos’s desire to demonstrate ASEAN friendship. It also served as a curtain raiser for the Malaysian Automotive Industry Exhibition (MAX ’95) held in the Philippines that July, following the successful launch of the Proton Wira there early this year. The organisers were Perusahaan Otomobil Nasional Berhad or Proton (the manufacturer of Malaysia’s national car), Edaran Otomobil Nasional Berhad or EON (the distributor of Proton cars), Usahasama Proton-DRB Sdn Bhd or USPD (the manufacturer and distributor of Proton Satria) and Perusahaan Otomobil Kedua Sdn Bhd or Perodua (the manufacturer and distributor of the second national car). 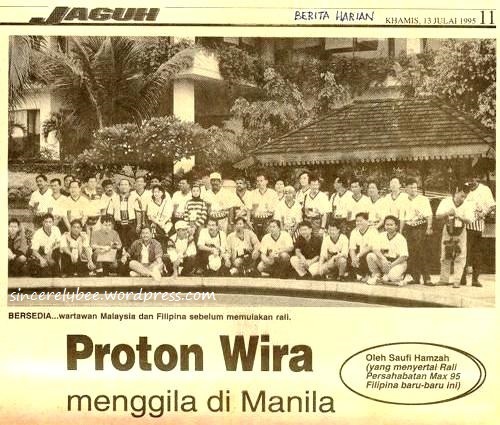 The group of 20 Malaysian journalists from the print and electronic media arrived in Manila on 28th June 1995 and checked into Edsa Plaza Shangri-La Hotel. That night we were introduced to our Filipino counterparts and briefed on the do’s and don’ts. Reminders like “do not overtake unnecessarily” and “do not drive recklessly” sounded simple enough to remember. On 29th June, we took the domestic one-and-only flight daily from Manila down south to Legazpi City where the flag-off was to be held. After the 45-minutes flight, we checked into the Mayon International Hotel, named after the infamous coned Mayon volcano. Arrived in Legazpi City airport with Mt Mayon visible in the background; Group photo upon arrival. We were taken sight-seeing to some popular spots, including the Cagsawa Ruins, from where we could catch a breathtaking view of the 2,400m Mount Mayon. History has it that the volcano erupted in 1814 and buried the whole town of Cagsawa in lava, leaving only the church steeple visible today. In an excitement to capture the scenic views, one of the journalists dropped and broke his camera. Left: The church steeple in Cagsawa Ruins; Right: Group photo against Mount Mayon in the background. The tour also included a drive to a candy store (!) where both the Malaysians and Filipinos stocked themselves sweet with home-made candies and on to the market place where cheap handicrafts could be found. Having relaxed and enjoyed the day, we were greeted with bad new during our briefing at night. The rally cars which were shipped from Malaysia much earlier apparently arrived at the wrong port in Manila. The slight setback was quickly solved by event co-ordinator Abdul Razak Dawood of EON, and his Philippines counterparts from Proton Pilipinas Corporation – the 30-odd members of the media were re-scheduled and packed into seven available Wiras instead, for the first of the three legs. It was an early start on 30th June for a simple but meaningful ceremony. Malaysian Ambassador to the Philippines Datuk Zainuddin Abdul Rahman and Mayor of Legazpi City, Imelda C. Roces jointly flagged off the cars, one at a time. Also present was Albay province Governor, Victor S. Ziga. The cars being flagged off. (L) TV3 crew with Malaysian Ambassador to the Philippines Datuk Zainuddin Abdul Rahman; (C) All set to drive? … well, not quite…(R) Back in the passenger seat where I belonged! Armed with a rally tulip, a road map, new partners and a load of enthusiasm, the journalists set off on their mission to conquer the Philippines roads. For the Malaysians, being unfamiliar with the roads and left-hand drive cars, some opted to be navigators and passengers instead. Within minutes of being flagged-off, all reminders of not speeding and overtaking unnecessarily flew out of the windows. Everyone just sped out of sight! The first leg, from Legazpi City – Daet – Lucena City – Manila, covered 560 km. No sweat, it was like travelling from Johor to Penang, or so we thought, except that we had not anticipated the road conditions. As we drove on the two-lane “highways”, Abdul Razak’s warning came ringing into our ears. “The stage between Daet and Lucena is very dangerous. It’s winding, slippery with broken road surfaces. PLEASE be careful.” It was almost a plea. It had fallen onto deaf ears till we saw it for ourselves. Certain stretches seemed to be going nowhere, some roads were bumpy, covered with mud while others have big potholes. Several times we encountered one-lane road and were horrified to find ourselves coming face-to-face with an on-coming vehicle. Throughout the journey, we were privileged to be escorted and led by Filipino rally drivers who are members of the Activity Asia Association (AAA), their rally club. And for safety purpose, two tow trucks travelled along with three service vans and an ambulance. One of the rally drivers had continuously cautioned us, “Jeepneys are the kings of the roads, not you. The roads are also the children’s playground, please watch out for them. Oh, and watch out for the animals too!” The warnings came again at lunch time. What a nightmare when we found out he wasn’t just paranoid. Every now and then, we came across native kids playing by the roadside and pedestrians crossing the roads without a care in the world. Pouring rain that afternoon made the roads more muddy and slippery, but thank god for the native kids, even as they played by the roadside, they helped direct the traffic especially on those one-way stretches, by waving sticks tied with a green cloth to indicate “clear” and waving a red one to indicate “stop”. The journey was memorable as certain stretches were close reminders of the coastal roads along Tanjung Bungah, Penang and the scenic views of padi fields brought to mind the rice bowls of Kedah. By dinner time, we made it to Lucena City, dirty and tired while the cars, dusty and muddy. The feast at Sulo Sa Quezon was a great treat. Feeling fat and contented, the participants travelled in a close convoy to arrive safely back in Manila by 10pm. While some hit the sack, others found the energy to check out the night spots. And I still had deadlines to meet, being the only one in the group who sent stories and visuals home daily via feeds while the others wrote special reports only when they got home. Everyone was up bright and early for the second leg of 473 km from Manila – Tarlac – Alaminos – Subic Bay. Lo and behold, the original fleet of Perdanas, Satrias and Kancils greeted us in front of the Edsa Plaza Shangri-La Hotel. And better news was that they were all fixed with communication radios. So throughout this second leg, the participants – who had now changed cars and partners – entertained each other with rounds of jokes. After lunch at Maxine Restaurant in Alaminos, we were made to travel bumper-to-bumper. With the headlights flicking away, the white, red, blue, metallic green and silver cars attracted more attention and made heads turn as we travelled on better roads. The highlight of the second leg was a visit to the Proton assembly plant in Pengasinan. It is the first Proton facility outside Malaysia which was jointly opened by Dr Mahathir and Ramos in January 1995. The rather barren land now will create 700 jobs and produce an average of 20 Proton cars a day when completed in 1997. The site provided a super special gravel stage where both the Malaysian and Filipino drivers wasted no time in testing out their racing skills and gave quite a performance. (L) Doing a stand-upper at the Proton Assembly Plant in Pengasinan; (R) The tables turned and I was interviewed by Philippines’ Auto Review journalist Lourdes Tan. It was dark by the time we reached Subic Bay where we had a hearty meal at the Hollywood Steakhouse. Upon checking into the Subic International Hotel, I thought I had stepped into a military barracks, for the hotel was refurbished from one. Everyone looked forward to the following morning. Not only was it the final day of the rally, but we also had a chance for some shopping at the duty-free haven. And mind you, not only the girls jumped with joy, the guys apparently had longer shopping lists! We also had the opportunity to witness the good infrastructure and facilities that the Americans left behind when they left their largest naval base in Asia in 1992. Group photo in Subic Bay. We re-fuelled our bellies at the Golden Dragon Restaurant (which was within minutes’ walk from the hotel) and geared up for the short 150 km drive from Subic Bay back to Manila. On that warm and fine Sunday, we took a pleasant three-and-a-half hour drive on the four-lane highway. As we entered Metro Manila, police escorts cleared the way for the convoy to move towards the Quirino Grandstand, Luneta Park. Present to welcome us were VIPs from the organisers and hundreds of locals. The participants and the cars were introduced to rounds of applause. By then each car had collected six stickers from various Governors of the towns that we stopped by. Metro Manila Mayor, Alfredo Lim put on the final sticker as a grand finale and presented all participants with flower garlands. Everyone was a winner! The “winners” in a commemorative photo at the finishing line. Receiving the garland from Metro Manila Mayor Alfredo Lim; Yau CH of Nanyang; Zakaria of Mingguan Sukan. Throughout the journey, we got to know our Filipino counterparts and their country better, while they got acquainted with our national cars. At the end of the rally, there were new friendships forged, several punctured tyres, a busted radiator, good reviews nevertheless, and despite one broken camera, rolls of photographs reminders of a blast of an experience. At the MAX 95 Friendship Rally dinner & prize presentation in Shangri-La Makati Manila… (Top, L-R) Malaysian Ambassador to the Philippines, Datuk Zainuddin Abdul Rahman; former colleague Louis Cheang of The Star; Sharif of NST and Leslie of Bostock Mohd; Abd Razak Dawood, Senior Manager of EON; (Bottom, L-R) With our Filipino counterparts, Nina Santaromano of Sports Life; Chris Tio of The Freeman; Conrad Carino of Business World. (L) Standing next to “the king of the road” – a jeepney, a common sight on the Philippines roads as it is a popular mode of transportation; (R) Notice who has more shopping bags. Post rally we got together one more time for an appreciation dinner, thanks to TK who arranged it just before I left for my postgraduate studies. Article in Berita Harian, 13 July 1995. News article in The Philippine Star, 3 July 1995. This entry was posted in Travel Back in Time, TV Time and tagged Travel, TV3. Bookmark the permalink.